In 1858, in Lourdes, France, a young peasant girl named Bernadette Soubirous encountered an apparition she described as “a small maiden.” The maiden spoke to Bernadette, revealing herself to be the Blessed Virgin Mary, and directed Bernadette to dig in a specific spot. This unearthed the famous spring of Lourdes water that is now said to heal the ailments of believers who drink or bathe in the water. 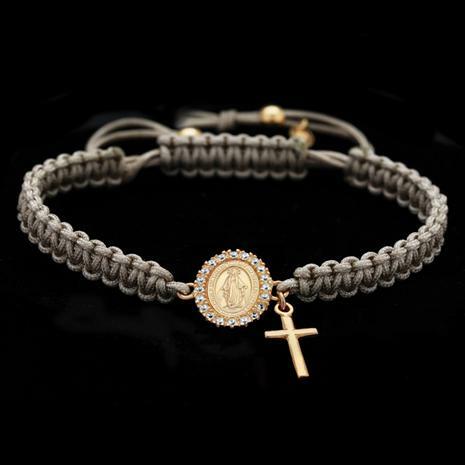 The Lady of Lourdes Bracelet is handmade in Italy and celebrates what is today called Our Lady of Lourdes. A simple bracelet of meticulously woven macramé holds an Italian gold-finished sterling silver pendant inscribed with the image of the Virgin Mary, bathed in the light of 40 lab-created DiamondAura® rounds, with an attached gold-finished sterling silver cross. This simple and elegant display of faith can be worn as a reminder that miracles are always possible. Drawstring style fits wrists up to 8 1/2"